The whitework technique simply means, white thread embroidered on white fabric. Whitework designs are usually delicate "looking" designs that can be embroidered on pillow cases, curtains, purses, handkerchiefs, sheets, etc... Please feel free to embroider this design in a different thread color if you would like. Finish Size 4.22" x 3.66"
This design is also available in a larger set. 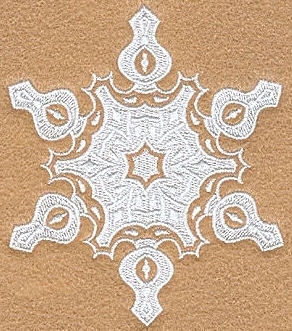 Just click on the "Snowflake Whitework Set, 12 Designs - 5x7!" link above in the "You might also like" section for more information.